Spring is finally here, we'll soon be enjoying lighter evenings and being woken by sunlight! Hooray! Following on from my previous post, Prettying Your Dressing Table. I've already made the change regarding perfumes. 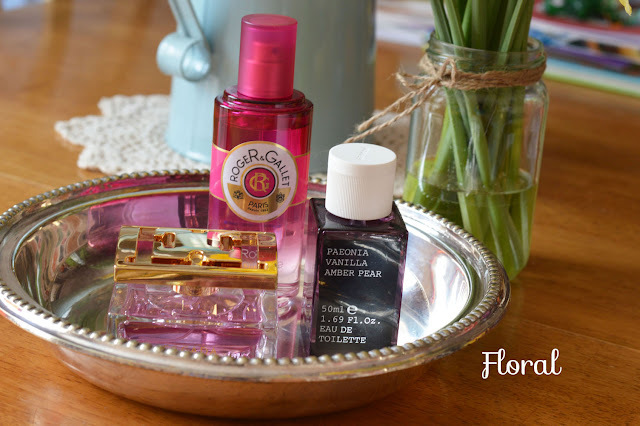 I love strong scents all year round but during Spring/Summer time I tend to save the stronger scents for the evenings or special gatherings. 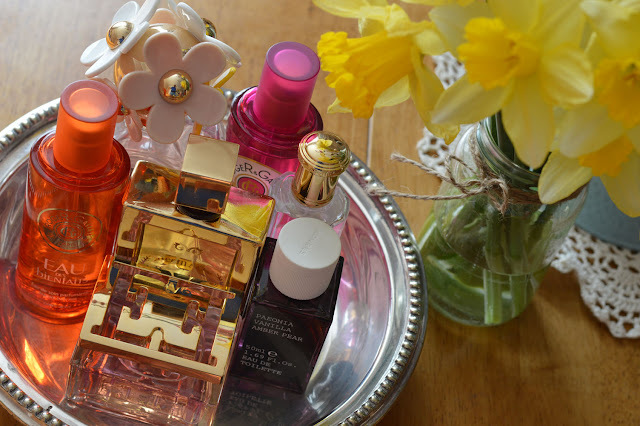 I've picked my favourite Spring scents and wanted to show you what I've been reaching for recently. One of my favourite Summer scents is a limited edition from Escada but didn't want to feature a scent which is no longer available. Don't you hate it when this happens? I'd like to start with my newest love and that is Reem Acra*, the bottle is both decadent and chic. The beautiful gold floral detailing with signature doves, makes this bottle truly admiring. A popular scent amongst the celebrities so it comes as no surprise this perfume is exclusive to Harrods over here in the UK. The perfume was designed by fashion designer Reem Acra, famous for producing stunning bridal gowns, but also equally beautiful dresses for the red carpet celebrities. The mix of notes is sophisticated and alluring, a scent which I find myself wanting more. So I've been indulging in numerous top ups during the day! Top Notes consisting of pear, orange blossom and bergamot. Middle Notes- ginger, lily of the valley, jasmine and peony with Base Notes- amber, cedar, patchouli and musk. Other favourites to make it into this post are, Marc Jacob Daisy Eau So Fresh*. This bottle definitely wins prettiest perfume bottle. Thankfully the perfume itself is equally beautiful, this would be the perfect bridal scent in my opinion. It's surprisingly long-lasting, which is rare with floral scents I find. Fruity Top Notes- Grapefruit, Raspberry, Green Leaves and Pear. With floral Middle Notes such as- Violet, Wild Rose, Apple Blossom and Jasmine Petals. Ending with warm Base Notes- Plum, Musk and Cedarwood. Following in similar foot steps is Yardley Daisy*. Similar name and very similar notes to Eau So Fresh. After comparing notes they both share green leaves, rose and musk. This is certainly comparable to Marc Jacobs Eau So Fresh, it's a cheaper version so if you're on a budget or want a purse duplicate this would be the one. Plus in Boots it's only £6.66 at the moment for 50ml! It's the perfect handbag size. My bottle has been summoned to my handbag since beginning of March. The next trio of fragrances come under the floral umbrella, just looking at them you can probably tell. I've been reaching for Korres Paeonia/Vanilla/Amber Pear EDT* lots lately. The scent is very long lasting which is always a bonus, I've learnt this is my 'breaking' into spring/summer fragrance. As I mentioned before I adore musky heady scents and this has a lovely dry down of notes which is not heady and very soft with floral middle notes. I think this clever combination is perfect, I still get my fix but it's still a soft delicate scent. Especially Escada* contains two amazing scents, rose and ylang ylang. These work incredibly well together. 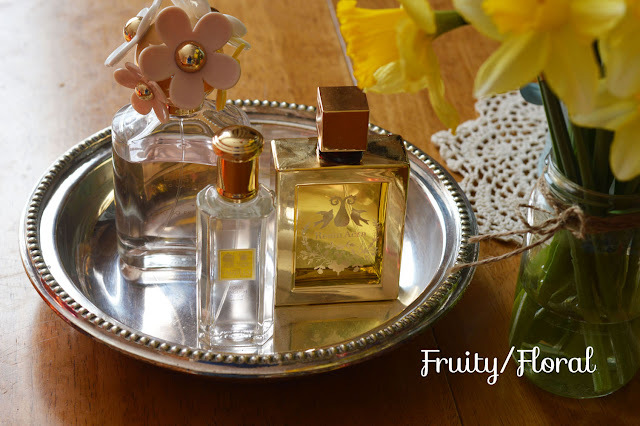 A beautiful spring time scent for day time. The bottle looks so pretty and decadent with the pink perfume visible. One to show off on your dressing table. 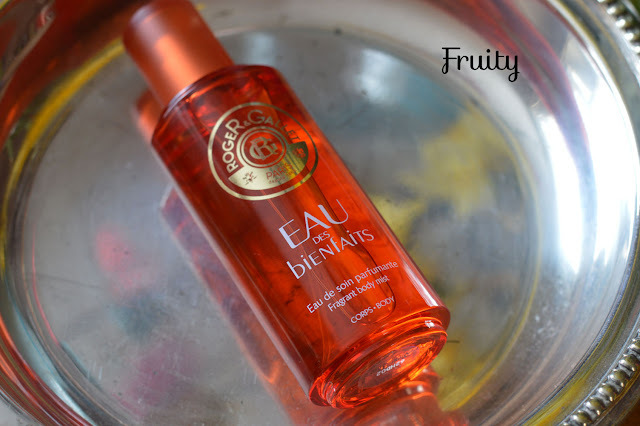 Roger & Gallet Rose Imaginare* could easily fit into the fruity/floral department but on me I can't pick up the fruity notes just the floral notes. It's described as a water spray, I would say this is like a body mist/spray. It's light and not long-lasting like you would expect from a perfume but nonetheless it's still a beautiful scent and one which you could top up during the day. If you don't like to wear heavy scented fragrances this would be perfect, Roger & Gallet have a great selection of water sprays depending on your favourite scent.